Great location next to the slopes. This condo has recently been remodeled in a contemporary style with your comfort, lightness and brightness in mind. The living room sofa even has a recliner with built in massage seat! The beautiful kitchen has all new appliances. There is an extra TV in the master bedroom. The old tube TVs have been replaced with HDTVs. A large, open living-dining area is planned around a massive stone fireplace. The fireplace is wood burning and we supply the wood. The bedrooms are spacious with large closets. Two sliding glass doors give access to the large balcony. 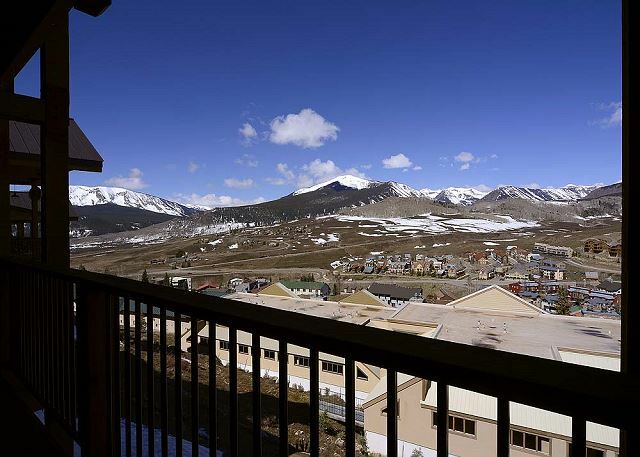 Enjoy incredible views of the town of Mt. Crested Butte, Washington Gulch, and the slopes. The unit is fully furnished, down to the linens and dishes. I202 is conveniently located steps from the slopes and trails. The International Building is entered on the 3rd floor. Walk down one flight of stairs and you reach I202 on the 2nd floor. Your condo is near the West Wall lift. A short walk to the end of the parking lot, skis on, and you are on the slopes! housekeeping to come back the morning after our arrival. While they tried their best, upon arriving home, we realized we have dog hair on clothes we didn’t even wear. If the owner of this condo is going to bring their dog they should make a note in their listing stating such and letting people know the will have dog hair everywhere. I am allergic to dogs and had I known this we would have never rented this unit. Our group enjoyed this place !! Ski in and ski out ! It was so great ! And the condo people are so so so nice !!! It's our main choice when we travel to this area. comfortable condo, lots of room, updated and very nice; staff friendly and accommodating. I left with all the keys and had to mail back, they were understanding !! Have been renting for the past 6 years and plan to continue! Thought the place needs updating, the layout and proximity to the slopes was great. The snow was sparse this year, so it was barely a ski in/out place, since the runs right next to it weren't open. But Buckly was open and we were able to ski at an angle from it to the parking lot and then walk the rest of the way. The furnishings in the condo were quite adequate. The kitchen is basic, but functional. We were able to get our family of 8 around the dinning room table or around the living room TV just fine. There's a bit of a traffic jam in the bathrooms, since there are only 2. But that was due to our choice of a 3-2. Overall a very positive experience!